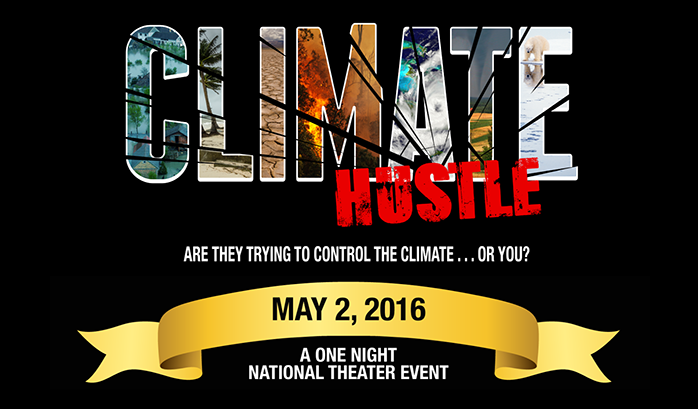 I finally got to see the feature-length documentary film Climate Hustle (Producer/Director: Chris Rogers, Host/co-writer: Marc Morano, CFACT, 2016). It was released today in 400 cinemas for one day, including in Toronto. Disclosure: I make two brief appearances in the film, along with some 30 other scientists. I don't believe in dangerous anthropogenic global warming . I have scientist friends who don't believe in dangerous anthropogenic global warming. I have never received any money from the energy industries, and I have never received anything for expressing my views on climate, other than insults and threats. Hustle is a solid, well crafted, and highly entertaining documentary film that makes extensive use of authoritative sources. Namely, serious scientists who have substantively questioned the agenda-driven global warming bandwagon, and who are willing to say so publicly. The film is a precious contemporary record of the politicization of establishment science, and also documents how conscientious scientists can come to dissent from a majority view, when too much is too much. The personal story of highly regarded climatologist Judith Curry is simply riveting in that regard, as are others. The historical 1970s footage of "the coming ice age" frenzy and the depictions of the shrill current alarmists are priceless. And I love the interviewed writer's explanation of the human psychology of alarmism. Hustle is fast-paced, fun, and thought provoking throughout. The characters are wonderfully human. The film does give the impression, which can also be detected in the scientific literature, that climate scientists will correct their over zealous departure from objectivity, but it's not at all certain that the main culprits will be purged. In my opinion, the likely scenario is that the science will now go on its merry way and the US-regime global architects will implement what ever they can get away with in the cloud of publicity, institutional and diplomatic deception that they have created . I have three criticisms of Hustle. The first is the film's use of a graphical illustration tactic that is based on a scientific error. CO2 is not a "trace gas". It is a "minor constituent" of the atmosphere. "Trace" has a precise scientific definition. More importantly, it is irrelevant how little CO2 there is. What matters to global radiation balance is not the small amount of CO2 or of greenhouse-effect gasses, but rather the degree to which the resulting atmosphere is opaque to infrared radiation. That is, the amount of gas must be multiplied by the resonant absorption cross-section of the molecule. The said resonant cross-section of CO2, in the relevant band, is huge, which is why the CO2 effect is "saturated" and increasing the CO2 atmospheric concentration has little impact on surface temperature . Thus, the film's short cartoon segment with coloured cubes representing the gas constituents of the atmosphere is a false representation, based on incorrect logic, or incorrect physics if you prefer. This error is essentially the same misrepresentation that Al Gore used in reverse to suggest that increasing CO2 has a proportionate impact on climate. Hustle correctly has a scientist explain the error in the Al Gore stunt and did not need the coloured blocks. I guess it was just too tempting to leave out, and the host's script was not reviewed for accuracy by a physicist. Secondly, I dislike the particular and brief ending point that those who will suffer most from the global policies to enforce a carbon economy are the planet's most vulnerable, who do not have clean water and electricity. While this is true, and has been brilliantly documented in Amy Miller's The Carbon Rush, it is nonetheless a cheap shot to go there, equal to Al Gore followers' disingenuous concerns for the planet's vulnerable peoples. The main players opposing carbon trade restrictions have interests other than improving the lives of distant brown populations. Thirdly, I am concerned about the elephant in the room. While Hustle has convincingly exposed the politicization and complicity of establishment science, a la "slap in the face", it is silent on the true underlying driving forces that are geopolitical and economic in nature and that are comprised of opposing (though unequal) corporate blocks beyond simple citizens and activists . While the film's answer (here) is good, it is far from complete, and addresses only the mechanisms of professional engagement. It does not address the overall movement of a larger system and the real economic battles on national and global scales. The global finance instruments of the US regime do not gear up to impose a carbon economy out of popular demand, to spread democracy and justice, or to save humanity, nor does all of this simply self-organize spontaneously out of professional self-interests . Possibly the first to signal the global finance reality of the then newfound media phenomenon of climate alarmism was the late historian of science and technology David F. Noble, on a blog that I host . The film was a riot that I totally enjoyed. Alexander Cockburn, Dissidents Against Dogma, CounterPunch, 9 June 2007; and The Nation, 25 June 2007; and see Dru Oja Jay, Questioning Climate Politics: Denis Rancourt says the “global warming myth” is part of the problem, The Dominion, 11 April, 2007. Denis Rancourt, Carbon Reality Check, Dissident Voice, 30 April 2016. See: Denis Rancourt, Radiation physics constraints on global warming: CO2 increase has little effect, archive.org, 3 June 2011; and video lecture of 21 November 2015. David F. Noble, The Corporate Climate Coup, Activist Teacher, 1 May 2007.